The street of Melbourne is dotted with numerous sculptural icons – the visually stimulating and the whimsically humorous, the mind baffling and the disastrously controversial, the vainglorious posthumous statues of important white men, the aesthetically pleasing objects, and the many other meaningless commissions lacking artistic merits. 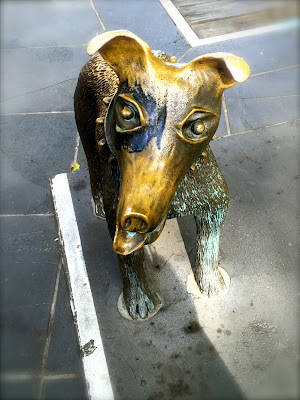 Larry La Trobe, the 70 cm in height dingo-like dog seated at the north of the not very impressive City Square, is a strange creature that attained its fame from all the wrong reasons. Created in 1992, it was named after the artist Pamela Irving’s uncle (Larry), and the first Liutenant-Governor of the state of Victoria (Charles La Trobe). Despite the lovely name, there is really nothing too spectacular about this tiny bronze sculpture, no legendary story depicting its real life’s loyalty or bravery, and neither is there any significant historical event associated to it or to account for its presence at the city central. Yet it has achieved a status almost equivalent to the beautiful Hachiko in Tokyo and Greyfriars Bobby in Edinburg. A two-metre high replica of the dog was being hailed in celebratory form in the 1996 Moomba Parade, and was apparently being paraded again in Osaka a year later and won the Best Float award in Japan. It all began on a mystifying night of 30 August 1995. The 30 cm bolts securing Larry La Trobe to its faithful place were being mysteriously removed. The statue has disappeared without a trace, to the great astonishment of the city dwellers. The puzzling affair received immediate attention from Melbournians, and a campaign was started in search of little Larry. The curious incident captured the imagination of the people: What was the motive behind the kidnap of a bronze dog without a demand for ransom? Was it a joke played too far? Has little Larry been melted down, or has the poor creature been drowned in the Yarra River? Despite the widespread publicity and media campaign, little Larry has never been recovered, and the culprit remains unknown. Thanks to Peter Kolliner (the previous owner of the foundry where Larry the senior was originally casted), Larry the junior came into life in 1996. The second Larry was casted in the same mould as its predecessor, albeit with a slight hint of redder appearance. It was officially unveiled on 16 September 1996. Following the reinstallation of Larry La Trobe, the extensive interest on the curious incident of the dog that went missing slowly faded away. The story became part of the thick invisible archive of unsolved mysteries in Melbourne. Today, Larry La Trobe (the junior) is one of the most well loved sculptures in Melbourne. Children adore the little pet and frequently bestow it with generous love and affection. Larry La Trobe is pampered daily with hugs and kisses from young kids, and continues to enjoy its stardom in Instagram and Facebook.